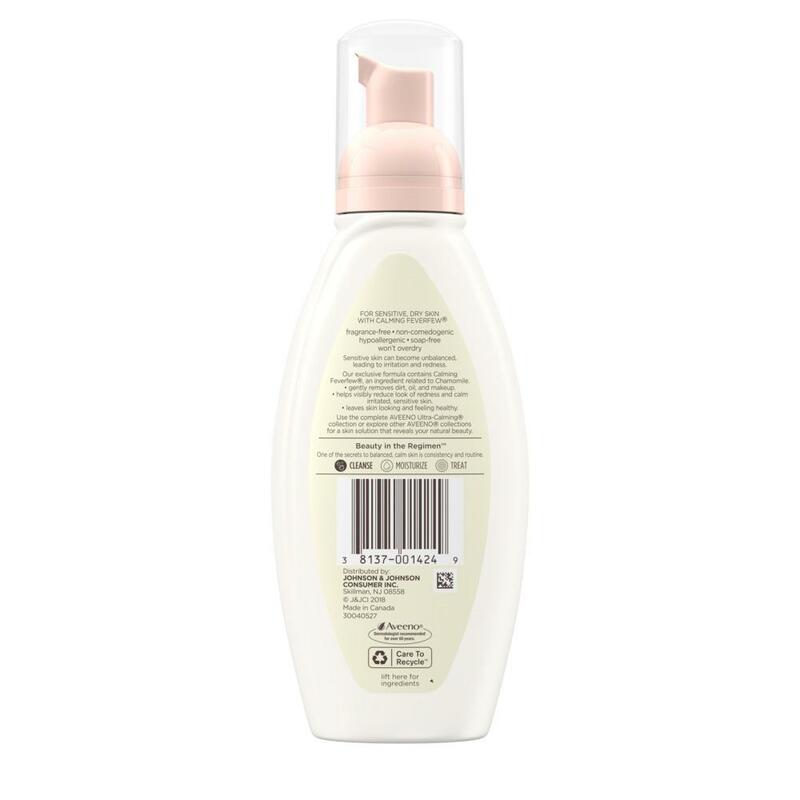 AVEENO® ULTRA-CALMING® FOAMING CLEANSER is rated 4.4 out of 5 by 115. This gentle foaming cleanser lifts away dirt, oil and makeup without overdrying or aggravating even very sensitive skin. 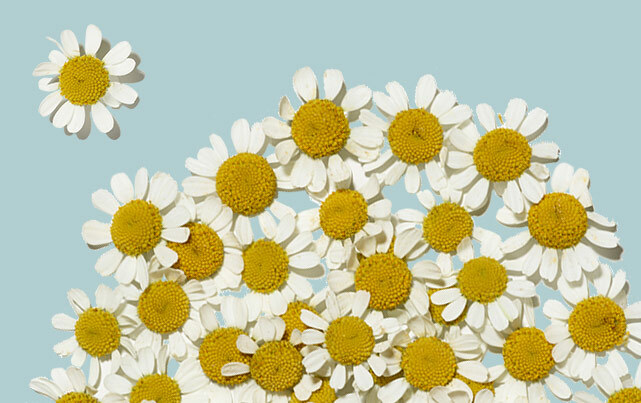 Formulated with CALMING FEVERFEW® , a natural ingredient related to chamomile, it helps reduce the appearance of redness and is gentle enough to use every day. It’s also fragrance free, soap free, noncomedogenic and hypoallergenic. Water, glycerin, cocamidopropyl betaine, decyl glucoside, citric acid, ppg-2 hydroxyethyl cocamide, peg-16 soy sterol, polysorbate 20, disodium lauroamphodiacetate, phenoxyethanol, butylene glycol, sodium coco pg-dimonium, chloride phosphate, sodium citrate, tetrasodium EDTA, methylparaben, xanthan gum, propylparaben, ethylparaben, propylene glycol, chrysanthemum parthenium (feverfew) extract, sodium cocoyl amino acids, sarcosine, potassium aspartate, magnesium aspartate, sodium hydroxide. Formulas with CALMING FEVERFEW® significantly improve the appearance of facial redness and calm irritated or sensitive skin. While traditionally used for its medicinal properties, which include headache relief and fever reduction, CALMING FEVERFEW® is a skin care breakthrough. Purified feverfew extract has anti-irritant benefits and has been shown in preclinical testing to effectively deliver a broad range of antioxidant and calming benefits compared to over 2,000 other natural ingredients. Rated 5 out of 5 by Amanda3193 from My skin is so soft and smooth I’ve been buying this product for several years and I love it! It masks my skin look and feel smooth and clear of impurities. Rated 5 out of 5 by medford from Cured my acne I bought this over a month ago, and I have seen drastic changes. Within the past few months, my skin has been extremely sensitive and I have not been able to use anything containing charcoal and salicylic acid. This has cured my red spots and never-ending acne. If you have the same problem as I do, I highly suggest this product! Rated 3 out of 5 by Lucille from Defective product pump the product is good, better than most I have used; addresses my needs of a product with no fragrance, and gentle enough for my sensitive skin. The product pump is defective, the pump gets stuck and does not come back unless manually done. Too frustrating to use. There are other products either as good or better. I have addressed the product issue with Aveeno in the past, several months ago. No improvements. Rated 5 out of 5 by Erin94 from In love with this foaming cleanser!!! I have developed really sensitive skin that dries out very easily within the past 2 years after having my daughter and this cleanser has been a god send for my face! I have an oily t-zone and mild rosacea on my cheeks (also acne prone) and this cleanser calms my redness down while getting all the dirt and oil off my face without over drying my skin. Leaves my skin feeling soft and clean and does not cause breakouts. Would definitely recommend for anyone with sensitive skin.